Weekly Roundup 8-3-15 – Peninsula Moves! Fiesta De Artes Returns to Los Gatos: More than 150 artists will be featured at this weekend’s Fiesta De Artes event in Los Gatos, an annual family-friendly gathering in the South Bay town. The festivities will take place from 10 a.m. – 6 p.m. on Saturday and Sunday at the Los Gatos Civic Center grounds, which are accessible from the Santa Clara Valley Transportation Authority’s 48 and 49 community bus lines. Over 20,000 people are expected to attend the two-day event, which will feature numerous displays from local artists, live music, wine and beer tastings, and plenty of food offerings. For the 19th straight year, the Kiwanis Club of Los Gatos will sponsor the Fiesta De Artes. Caltrain to Single-Track at 22nd Street in SF This Weekend: As part of its ongoing San Francisco Roadway Bridges Project, Caltrain will operate on a single-track through the 22nd Street Station this weekend. As a result, it will be necessary at times for passengers to board the train from only the northbound or southbound platform at the station. There will be message boards, electronic displays and audio cues posted throughout the weekend to give customers boarding instructions during the single-tracking. Starting at 8 p.m. on Friday, Caltrain will begin demolition of the 23rd Street Bridge, which will require the track closures. Work will last intermittently throughout the weekend, ending at noon on Sunday. Caltrain is replacing three bridges in San Francisco because they are deemed structurally deficient and do not meet existing seismic safety standard. 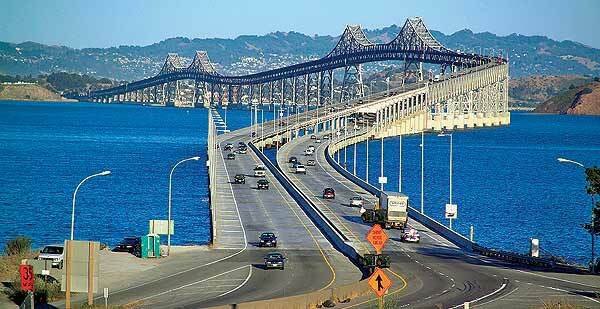 Improvements Coming for Richmond-San Rafael Bridge: The Richmond-San Rafael Bridge, a vital artery that connects Marin and Contra Costa counties, is in store for some upgrades. The Metropolitan Transportation Commission, the region’s lead transportation-planning agency, is coordinating a four-year pilot project that will convert existing shoulders on the bridge into an extra vehicle travel lane on the lower deck of the span (the eastbound direction.) The project will also include a pedestrian and bike lane on the upper deck, along with a moveable median barrier, which will allow for better management of traffic flow during the morning and evening commutes. The approval process for the project is scheduled to begin next year, with the completion of the improvements slated for 2017.